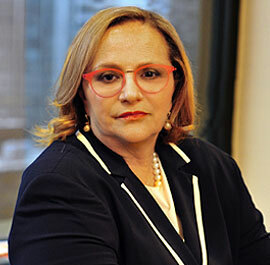 Today Ms. Joy M. Feinberg, partner at Boyle Feinberg Sharma, will be inaugurated as the President of the USA Chapter of the International Academy of Matrimonial Lawyers (IAML), where she has been a member since 1990. The IAML is a prestigious group of divorce attorneys who gather three times a year, once in either the United States or Canada, once in Europe, and once in one other international country, to explore family law issues that arise throughout the world as boarders disappear and families transverse internationally boundaries for work and by choice. During her two year presidency of the USA Chapter, Ms. Feinberg will lead this respected group of matrimonial attorneys in its ongoing exploration of similarities and differences between jurisdictions worldwide on issues affecting divorcing families; child abductions; premarital agreements and tax issues impacting ex-patriots. Ms. Feinberg will use her knowledge and experience to continue the international dialogue relevant amongst her esteemed colleagues and open avenues of cooperation across borders. As it is commonly known Ms. Feinberg will set the bar high and excel in all tasks she takes on during her term. As an avid speaker and presenter, the educational aspect of Ms. Feinberg’s term will be central to ideas and concepts she believes are important. These topics include programs focusing on intellectual property both in U.S. and around the world; the psychology of Prenuptial Agreements, and Tax laws affecting U.S. Citizens working abroad from the U.S. tax law and foreign tax law perspective, as well as other laws affecting US citizens working abroad. An aspiration during her term is to focus on implementing financing a Family Law student with a summer internship in the United States or elsewhere. Her desire rests in the experience she had while Ms. Linda Masina from the University of Cape Town in her home for three weeks during the summer of 2013. Joy’s law office spent time with Linda allowing her to grow as a soon to be lawyer and as a person. Many practitioners, judges and friends from Chicago helped in this endeavor and made Linda’s experience very special. Having the pleasure of working alongside Ms. Feinberg for three years now, I have been privileged to experience her compassion and dedication first hand. Joy has taught me to take chances and allow for change to be a part of my life. Her success and constant achievements prove great accomplishments result from change, vision and perseverance. Challenge and achievement also prevails in the newly merged firm created by Ms. Feinberg and her partner, Ms. Janet E. Boyle, where these two women lead the way for many young female attorneys. Congratulations Joy on an achievement well deserved!